Learn how to make a fingerprint flower necklace or keychain pendant. 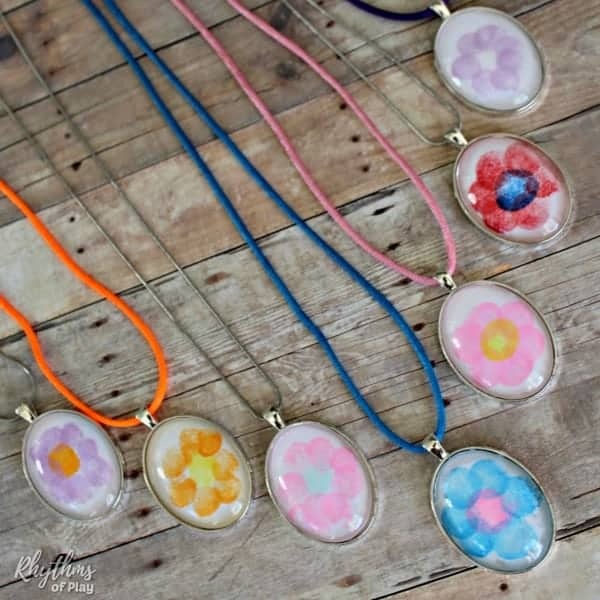 Use this easy flower necklace jewelry making tutorial to make one of a kind fingerprint flower keychain and flower necklace pendants your family will treasure. Perfect keepsake craft idea for May Day, Mother’s Day or your child’s favorite teacher! 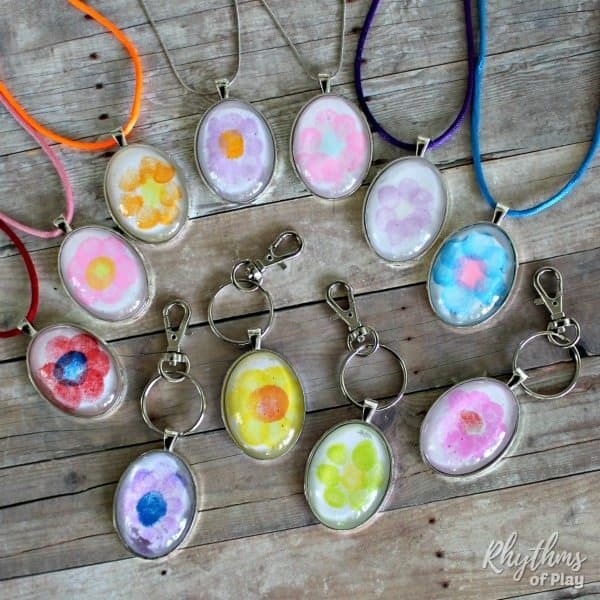 Gather the fingerprint flower necklace and keychain pendant jewelry making supplies that you would like to use below and follow the easy step by step directions to make your own fingerprint necklaces and keychains. Choose the type of fingerprint flower necklace and keychain pendant shapes, pre-made necklaces, and key rings you would like to use to make fingerprint flower necklaces and keychains from the materials list below. 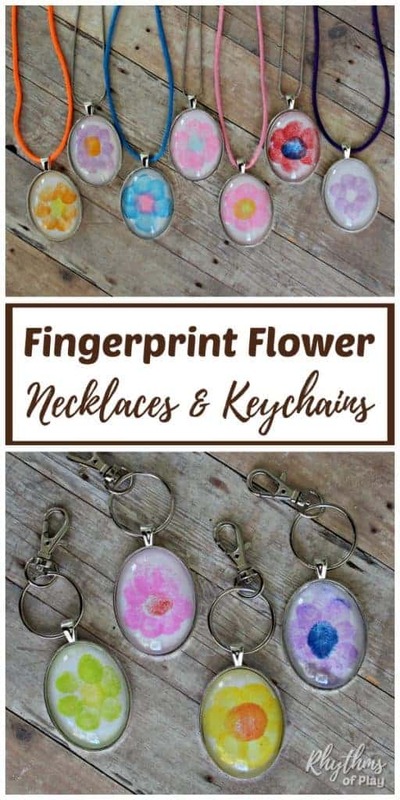 The video below shows how to make fingerprint art necklaces and fingerprint art keychain and backpack charms of all kinds including fingerprint flowers. In the video, my daughter demonstrates how to make fingerprint butterflies magical with gel pens. You can use a similar technique to spruce up fingerprint flowers too! If you would like to see a video that shows how to make a fingerprint flower click on the link to see our fingerprint flower glass magnet video. Step by written directions for making a fingerprint flower necklace can be found below. 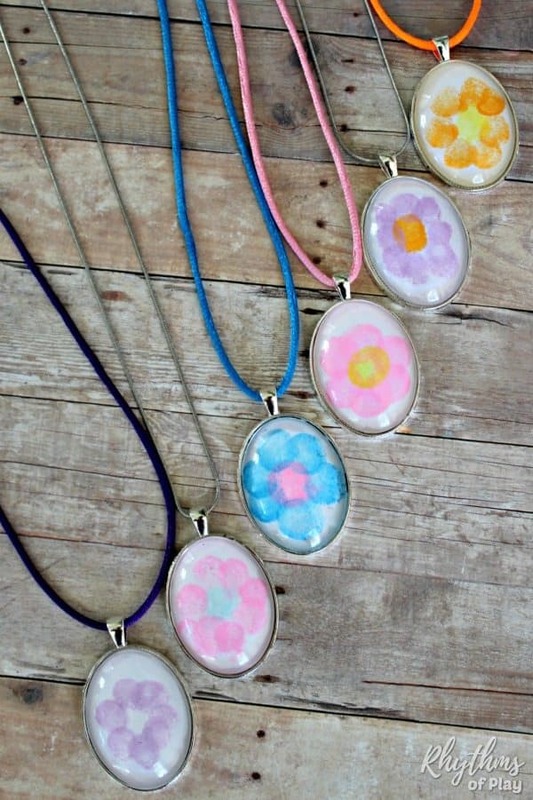 A child’s fingerprints can be used to make flowers for a necklace and/or keychain pendant. Use the easy directions below to make a fingerprint flower necklace or a fingerprint flower keychain. Press one fingertip into a finger ink pad. Gently press the same fingertip with ink onto a white sheet of paper. Select another ink color and press a different fingertip into the finger ink pad again. Create 4 to 7 fingerprint flower petals around the first fingerprint to make a fingerprint flower. Wash hands and allow fingerprint ink to dry before moving on to step 2. Place a drop of clear-drying glue on the back (flat side) of glass cabochon. Place the cabochon on top of the fingerprint flower glue side down. Use small scissors to trim and cut away the excess paper around the glass cabochon. Place glass cabochon with the fingerprint flower into the pendant tray and press down to remove air bubbles. Thread a necklace through the loop of the fingerprint flower pendant to finish your fingerprint flower keychain or necklace. Ready-made options can be found below. There are lots of fun and easy ways to use pendants to make necklaces and keychain charms. Click on the links for all the DIY details! Fingerprint flower necklace and keychain pendants make an easy gift idea for May Day, Mother’s Day, Christmas, a birthday or an end of the year gift for your child’s favorite teacher. 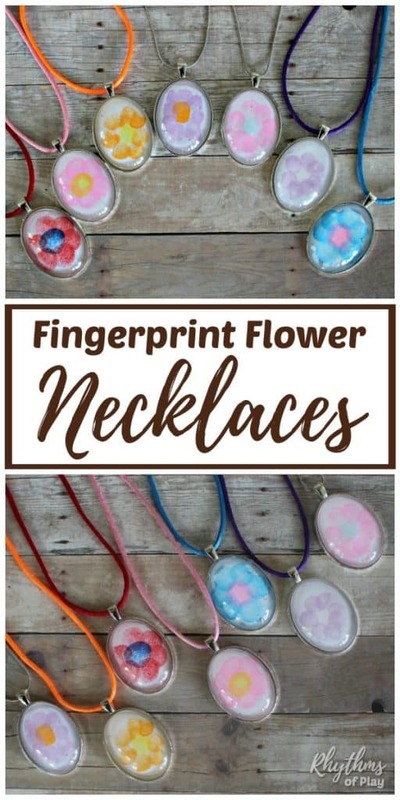 Invite your child to use their fingers to create one of a kind fingerprint flower necklace and fingerprint flower keychain keepsake gifts that friends and family will treasure for years to come. Another idea is to make thumbprint heart necklaces and/or keychains. Fingerprint art, thumbprint hearts, and fingerprint flower glass magnets also make wonderful gifts that kids can make. Simple keepsakes like a fingerprint keepsake gifts are always a favorite with friends and family. DIY photo necklaces and personalized photo keychains and personalized heart candle holders also make wonderful handmade gift ideas. Beautiful Handmade Gifts Even Kids Can Make!